This past week we started an entire home project that consists of a number of areas that we will be addressing in the home. One of the areas that we will address is the kitchen. So what are the options when you are updating a kitchen? When it comes to updating a kitchen, the most common option is to tear out the old and install new cabinets. When I work with clients who wish to do this, we typically look at the function and in most cases, we end up changing things around. PRO: You can get an entirely new kitchen layout that is more functional than what was previous. All of the cabinets will be new (including the boxes and the doors). You also will be getting a new counter. This can be in the form of granite, quartz, or other various materials at different price points. CONS: This is often the most expensive option. As mentioned above, most people look at layout changes which often involves plumbing changes, electrical changes, flooring changes and of course, new appliances. All of those items can really start to add up. This can often also take a bit longer from start to finish. If your cabinets are in good shape, and can be painted, this may be a great option for you. A huge transformation can definitely take place! PRO: Your dated, old cabinets can get a total new look. By painting your cabinets. you do not need to fill up the landfill or having to worry about selling them. In addition, you can carry out some minor updates. Different crown molding can be added prior to being painted. One of my favorite pros is that you can choose any color you want! The image below shows how we had a custom hood fan built to replace the old cabinet and hood fan. CONS: When cabinets get sprayed, it stinks And when I say it stinks, it stinks! For the most part, you really should not be in the home while this is being done. This can be anywhere from 3 – 5 days. In addition to the smell, there is a lot of prep work that has to be done prior to spraying. That means that having your cabinets sprayed can take longer than having brand new cabinets installed. In addition, you need to be aware that paint can eventually chip. While painters do a very good job in prepping the cabinets, it is just paint. Good bye honey oak. This kitchen was sprayed with Benjamin Moore Mascarpone. Refacing means that the cabinet doors and all gables (and anything else that is on the outside) will be replaced. A laminate or veneer is used on the cabinet boxes to match the new doors. PROS: Refacing is where you have the opportunity to totally change the look of your cabinet fronts. Most clients will choose a totally different look for the cabinet fronts (going from a dated profile to a more streamlined look). Another pro is that an entire kitchen can take about one week from start to finish. Since there are no changes to the layout, there is no need for any flooring repairs. By having cabinets refaced, you also have the opportunity to add extra cabinets (if needed) and adapt cabinets if necessary. CONS: While there are many pros, one con is that you only have a certain number of choices for colors as well as the style of doors. You know what a stickler I am about using the right color – especially white! How are we going to be updating this kitchen? While this entire blog is about options when updating kitchen cabinets, it really is important to understand the lifestyle that my clients have. We discussed hopes, dreams, and wishes for their space. Here are some key points that came out during our discovery stage. The existing kitchen layout was working just fine. Their family of three enjoy the raised eating area and did not wish to change that. There are three cats that are also part of this family. Take a peek at where at least one, likes to sit. Any guesses as to how this little one got up there? After reviewing the three options, we have decided to go with having the kitchen and all bath vanities refaced. There really is no need to rip of good cabinets and painting them was never going to be an option (with the cats climbing up to the top). While the cabinets are being refaced, we are also going to be installing new quartz counters. The entire process will take one week from start to finish to re-face this kitchen. I can’t wait to show you how this has all transformed! Want to stay in touch with how this project is coming along? Follow me on Facebook as I carry out live video updates! My clients recently purchased a home and were wanting to make some spaces more efficient and user-friendly. On my list was to create a butlers pantry and a closet-makeover. While they were two totally separate spaces, we addressed both areas at the same time. This is Part 1 of a two-part series for this home. For this blog, I’ll be going over the Butler’s Pantry Makeover. Let’s start with this space that is located just off of the kitchen. When my clients moved into the home, they did a lot of painting. Part of the painting was the existing cabinets. The gorgeous hood fan in the kitchen is a lovely blue. This blue is such a strong and rich statement. We decided to do all of the cabinetry in this color! I have used this color before and was excited to be working with it again! After discussing the items on the ‘wish list’, the conceptual design was created. A tall cabinet to house the cleaning supplies, brooms, a vacuum, etc. My clients wished to have their microwave (in a base cabinet). Floating shelves were a must! Here is what the butler’s pantry looked like prior to the work getting done. Part of the space was used as a dropping zone for….things. The previous owner had plumbing in already for a sink and we were lucky there were also outlets at counter height. The tall cabinet that now houses the cleaning supplies (out of sight). We chose a beautiful, delicate knob in a Golden Champagne finish. This finish, with the blue cabinets, is just so damn pretty! For the faucet, we continued with the Golden Champagne finish. My client LOVES to bake and can’t wait to use her new space! Love my Pantry! It so much fun to work in. Coming next week I’ll be showcasing their master closet makeover! I hope you stay tuned. This past week, I had a Trade Day at one of our upcoming renovation projects. There was a lot of preparation that went into getting ready for this day so I thought it would make a great post. First, if you are going to manage your own renovation, this post may give you some insight into how prepared you should be to obtain quotes from any trade. Secondly, if you are not going to manage your renovation, this will give you an inside look at to all the work that goes into this stage. First of all, what is a trade day? A trade day is a day where I book a block of time at the renovation site. I invite all of the required trades to meet me to carry out a walkthrough of the site. We discuss what is in their scope of work, we discuss any potential curve balls that we may run into, and we briefly discuss timelines. All the paperwork needed for my Trade Day. Arrange a day/time with my clients. Communicate with my clients the lists for each trade and add in/delete any task required. Call/email/contact the above trades to see if they could accommodate the date and time. Create a schedule for the trades. Create a list for each trade. Have the detailed drawings for each trade. Just so we have total disclosure, the above took a total of 6.5 hours to pull together in total. For this renovation project, the electrical part is the largest part and therefore, has the longest list. Part of the scope is to upgrade the electrical panel, add pot lights throughout the home, add additional light for the kitchen cabinets, and add outlets for the new island. I always create a ‘conceptual design’ for a lighting plan KNOWING that we will discuss options on site. Together, we make any changes so that the quote that I will receive is the most accurate. For this project, there isn’t a ton of plumbing changes that will occur. That being said, the home that is going to be renovated is an older home so I need to prepare (both timeline and budget wise) for any curveballs that may be seen. For the most part, the only thing changing is the location of the dishwasher. We will be adding in water lines to both refrigerators. We will also need to relocate a cold air return that currently sits on one wall that is coming down. That means the wall that I have planned to be installed may need to be moved 6″ – 1′ to accomodate this. THIS is something I need to know in advance and I’m happy to make that small change on my plans. I typically give my painter and flooring guys the same plan. What they really need to know is square footage. For my painter, he also needs to know how many doors, if he’s including baseboards and casings, how many colours of paint we plan on using, etc. For the flooring, we need to know who is looking after the substrate (preparation), and what my contractor will be handling and what they will be handling. Demolition of 3 walls in the kitchen. The new framing of 1 wall. Install of drywall on the new walls. Install of all interior doors, baseboards, casing. Trade Day – Why Do I Bother? is due to the fact that their quote will not factor in any curveballs that we may run into. While we do our very best to prepare, investigate and plan ahead, there sometimes are surprises and curve-balls that we just did not anticipate. The quote that I receive from the Trade Day also does not include any extras that my clients may add on after the fact. When the trades have provided me their quote, then the clients and I can continue to source product for their renovation project to pull together a final budget. I love knowing that I have a number of trade companies that I can call upon for all of my projects. Although I use more than one plumber, one electrician, etc., this is the crew that is going to be working on this project for me. While we look like a goofy bunch, we have a lot of fun working together and I know that these guys truly are part of my ‘A Team’. I am currently working with two clients who love the look of farmhouse sinks and faucets. While one client likes the more traditional look, the other client likes the more modern look. As I started to source the farmhouse sinks and faucets, I thought it would be neat to put together some of my findings. While many people know these as farmhouse sinks, what most people really wish for are called apron sinks. When renovating and getting new cabinets, the cabinet needs to be able to fit an apron sink. This means the front of the cabinet needs to have an opening for the front, or apron, of the sink. Crafted from enameled cast iron, this sink resists chipping, cracking, or burning for years of beauty and reliable performance. A standard apron front makes it easy to install on 36-inch apron-front cabinetry. The Self-Trimming® design requires only a simple rough cut, overlapping the cabinet face for beautiful results. Here is the same sink in a Double Basin. Image source for the image below is here. There are also stainless steel options for apron sinks and this beauty definitely caught my eye! This Strive kitchen sink offers professional style with easy-to-clean curved corners. Made of thick, premium quality 16-gauge stainless steel, the apron-front sink has a Self-Trimming design that requires only a simple rough cut, overlapping the cabinet face for beautiful results. For a more traditional look, here is one that I spent significant time looking at for one of my clients. This beauty only comes in two colors: white and parchment. What I love about a bowed apron front sink is that it gives a nice feminine curve to a space. I know there are many ways to do things, but I typically source the sink first and then source the faucet. Here are a couple of farmhouse faucets that caught my eye for my clients. A bridge faucet is popular to pair with an apron sink. I love the look of this faucet as it works with both the traditional look as well as a more modern look. 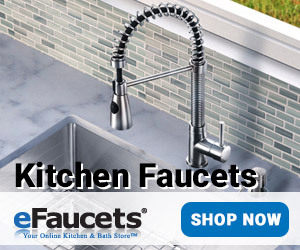 This particular faucet comes in Brushed or Polished Stainless Steel. This faucet below is by far, one of my favorites! For me, it just screams farmhouse style AND it comes in so many finishes! This faucet is one of my favorite single handle faucets. It has a pull-down spout with the DockNetik® magnetic docking system. There is also a 3-function sprayhead feature that includes Kohler’s Sweep® and BerrySoft® spray. This faucet comes in 5 finishes that include English Bronze, English Gold, Polished Chrome, Polished Nickel, and Satin Nickel. These faucets are made in Great Britain using regionally sourced solid brass and ceramic components. What that really means is they are very well made! Sourcing is one of the tasks that I love the most. While starting to source for my clients, I love seeing what options are available, what finishes are available and what the price points are. I always know that there is a way to get the look my client wishes for, within their budget!